The term “skilled” hockey player is often lost in translation to many youth players as they are growing up. 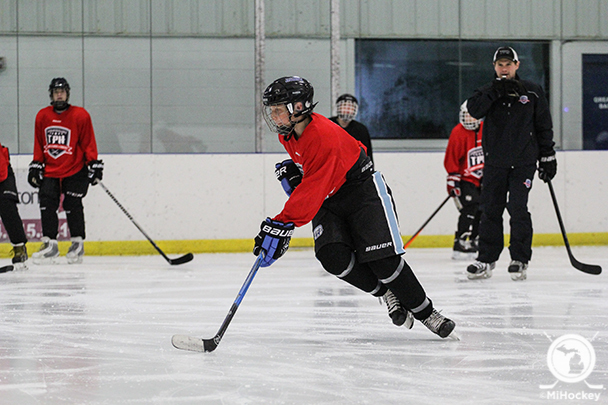 Many think of hockey skills like “dangling” or “throwing a sweet saucer pass” across the ice as a highly skilled play. We have all seen players who look unbelievable in a 3-on 3-shinny game or flipping a puck up and handling it through cones. The difference is that cones don’t hit back and can those players use those skills in an actual game? How relative are your skills to the game of hockey? In order for your skill to be relative to hockey it needs to be something that is game-like and has a high rate of success. Flipping the puck up and batting it through your legs looks pretty cool, but it is not a relative skill, as it will not work in a game. Examples of relative skill would be making a good pass and jumping into open space, shooting in stride or using your feet kick the puck up after receiving a bad pass. All of these are things that players at the top level do automatically and work on all the time. Most players in the NHL use their relative skills by reading the ice and making the game easier on themselves. They get really good at the so-called “little things” in hockey. Sean Perkins is the assistant director of the Total Package Hockey Center of Excellence in Canton, Mich. Click the image for more information about this year-round hockey school. Coaches and scouts at the next level look for players with a high degree of ‘relative skill.’ They look for players that do the right things with and without the puck. Some players are able to do some unbelievable things with the puck, but knowing when to do them and when to just make a simple play is far more important. Most of the time when a scout sees a player try to stickhandle through three opponents or try to make unnecessary plays, he crosses their name off of the list. They know that even if it happens to work at the level you are currently playing, it will not work at higher levels. A great example is Henrik Zetterberg. He is obviously one of the top players in the world, but he uses his relative skills very well. He doesn’t try to skate the puck from end to end or force plays that are not there. He protects the puck while making the opposition chase him and then moves the puck to an open teammate. He’s one of the best because he makes those around him better. Away from the puck he competes, finds open space and takes pride in being great defensively, which leads to more offense. For you as a player there are many ways that you can work on your relative skill. Take pride in every aspect of your position, whether it’s making a good first pass to break your team out of your own zone or backchecking hard through the neutral zone and breaking up an odd-man rush. All of these things matter. Your willingness to do all of these things could be the difference. More often than not, simplifying your game will get you a lot further than trying to do everything by yourself. Be a student of the game. Watch hockey games and study players and concepts. Don’t just watch the highlights. Watch what players do in specific situations and how they make the game easier to themselves and their teammates. Watch how they support the puck and what they do away from the puck in order to get it back. There is a reason why the best of the best seem to have the puck follow them all over the ice. Players that play the right way by combining their dedication, hockey IQ and relative skill will find their way.